Bill & Melinda Gates Foundation. "Brian Arbogast, Stephen Sobhani, Raya, and Elmo." The latest Sesame Street Muppet was unveiled this Wednesday. Her name is Raya, and she's a 6-year-old green monster. 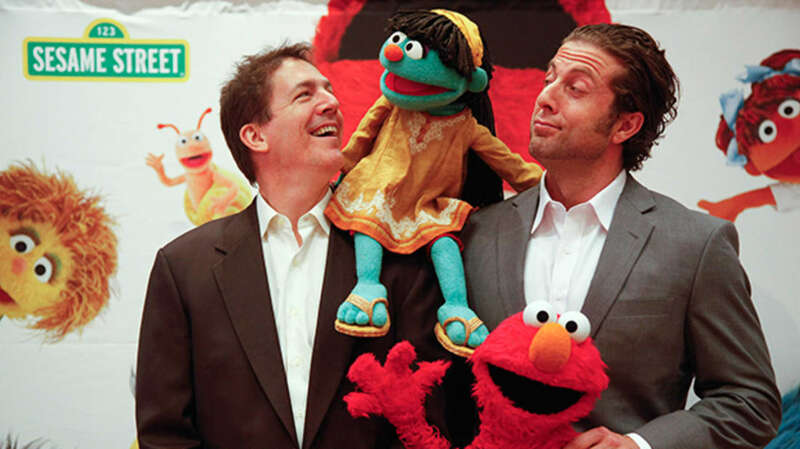 Raya will appear as part of Sesame Street's Cleaner, Healthier, Happier campaign in Bangladesh, India, and Nigeria. And she has a message: stay clean when using the toilet! Courtesy of the Bill & Melinda Gates Foundation. 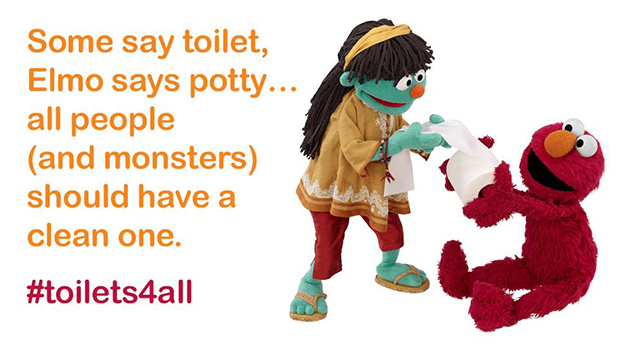 Introduced at the Reinvent the Toilet Fair: India, Raya is part of a long tradition of tackling serious issues on Sesame Street; see our 13 Sesame Street Muppets That Make a Difference story for a ton of examples. Happily, a recent study showed that Sesame Street has a measurable positive effect on kids' learning, including their knowledge about health and safety. Raya teaches kids the basics: handwashing, wearing sandals when visiting the latrine (in the target countries, many latrines are shared—and not particularly sanitary), and simply using a latrine if one is available (rather than just going in a convenient spot out of the way). This is an important issue, because today, 2.5 billion people don't have access to safe toilets. That's the reason we have World Toilet Day (yes, that's a thing)—check out 5 Reasons World Toilet Day is Awesome for some impressive toilet-related news (including a urine-powered cell phone). Having access to a safe toilet isn't just about convenience or smell—it's a public health issue. More people die each year from waterborne illnesses than HIV/AIDS, TB, and malaria put together.